Italian rabbi, cabalist, and poet; born at Ferrara 1688 (1693, according to Jellinek in "Orient, Lit." vii. 232); killed near Cento Feb. 25, 1743. About two years after Ricchi's birth his father removed to Rovigo, where he died four years later. 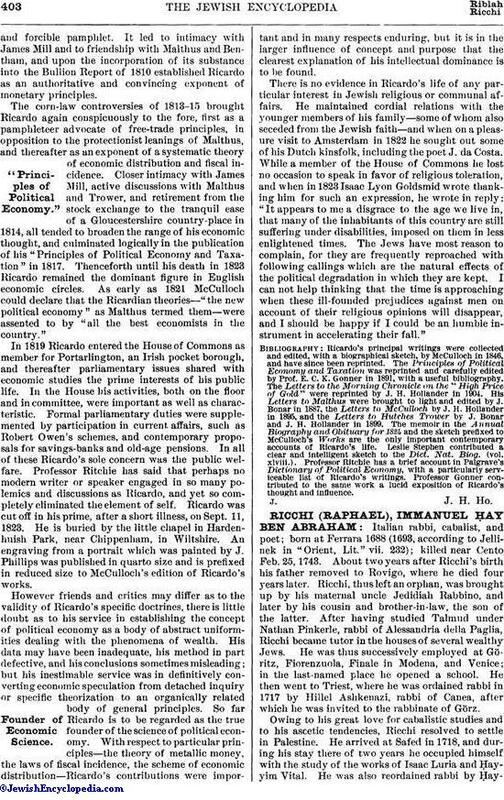 Ricchi, thus left an orphan, was brought up by his maternal uncle Jedidiah Rabbino, and later by his cousin and brother-in-law, the son of the latter. After having studied Talmud under Nathan Pinkerle, rabbi of Alessandria della Paglia, Ricchi became tutor in the houses of several wealthy Jews. He was thus successively employed at Göritz, Fiorenzuola, Finale in Modena, and Venice; in the last-named place he opened a school. He then went to Triest, where he was ordained rabbi in 1717 by Hillel Ashkenazi, rabbi of Canea, after which he was invited to the rabbinate of Görz. Owing to his great love for cabalistic studies and to his ascetic tendencies, Ricchi resolved to settle in Palestine. He arrived at Safed in 1718, and during his stay there of two years he occupied himself with the study of the works of Isaac Luria and Ḥayyim Vital. He was also reordained rabbi by ḤayyimAbulafia. In 1720 an epidemic broke out in Palestine, and Ricchi was compelled to return to Europe. On the voyage he and all his fellow passengers were captured by pirates and brought to Tripolitza, whence, through the efforts of Abraham Ḥalfon, Ricchi and his family were allowed to return to Italy. He then occupied the rabbinate of Florence till 1723, in which year he removed to Leghorn, where for twelve years he engaged in business as a merchant. He spent twenty months in travel, visiting Smyrna, Salonica, Constantinople, Amsterdam, and London, and in 1735 set out for Palestine, spending two years at Aleppo and three at Jerusalem. In 1741 he returned to Leghorn, and in 1743, while traveling in Italy for the purpose of selling his works, he was killed by robbers, who buried his body by the shore of the Reno. Six days later some Modena Jews discovered the remains and brought them to Cento for burial. 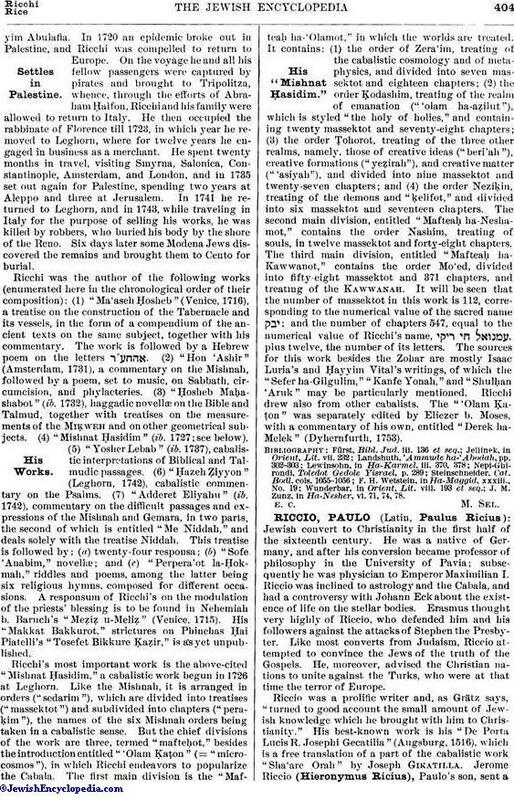 Ricchi was the author of the following works (enumerated here in the chronological order of their composition): (1) "Ma'aseh Ḥosheb" (Venice, 1716), a treatise on the construction of the Tabernacle and its vessels, in the form of a compendium of the ancient texts on the same subject, together with his commentary. The work is followed by a Hebrew poem on the letters . (2) "Hon 'Ashir" (Amsterdam, 1731), a commentary on the Mishnah, followed by a poem, set to music, on Sabbath, circumcision, and phylacteries. (3) "Ḥosheb Maḥashabot" (ib. 1732), haggadic novellæ on the Bible and Talmud, together with treatises on the measurements of the Miḳweh and on other geometrical subjects. (4) "Mishnat Ḥasidim" (ib. 1727; see below). (5) "Yosher Lebab" (ib. 1737), cabalistic interpretations of Biblical and Talmudic passages. (6) "Ḥazeh Ẓiyyon" (Leghorn, 1742), cabalistic commentary on the Psalms. (7) "Adderet Eliyahu" (ib. 1742), commentary on the difficult passages and expressions of the Mishnah and Gemara, in two parts, the second of which is entitled "Me Niddah," and deals solely with the treatise Niddah. This treatise is followed by: (a) twenty-four responsa; (b) "Sofe 'Anabim," novellæ; and (c) "Perpera'ot la-Ḥokmah," riddles and poems, among the latter being six religious hymns, composed for different occasions. A responsum of Ricchi's on the modulation of the priests' blessing is to be found in Nehemiah b. Baruch's "Meẓiẓ u-Meliẓ" (Venice, 1715). His "Makkat Bakkurot," strictures on Phinehas Ḥai Piatelli's "Tosefet Bikkure Ḳaẓir," is as yet unpublished. Ricchi's most important work is the above-cited "Mishnat Ḥasidim," a cabalistic work begun in 1726 at Leghorn. Like the Mishnah, it is arranged in orders ("sedarim"), which are divided into treatises ("massektot") and subdivided into chapters ("peraḳim"), the names of the six Mishnah orders being taken in a cabalistic sense. But the chief divisions of the work are three, termed "mafteḥot," besides the introduction entitled "'Olam Ḳaṭon" (= "microcosmos"), in which Ricchi endeavors to popularize the Cabala. The first main division is the "Mafteaḥ ha-'Olamot," in which the worlds are treated. It contains: (1) the order of Zera'im, treating of the cabalistic cosmology and of metaphysics, and divided into seven massektot and eighteen chapters; (2) the order Ḳodashim, treating of the realm of emanation ("'olam ha-aẓilut"), which is styled "the holy of holies," and containing twenty massektot and seventy-eight chapters; (3) the order Ṭohorot, treating of the three other realms, namely, those of creative ideas ("beri'ah"), creative formations ("yeẓirah"), and creative matter ("'asiyah"), and divided into nine massektot and twenty-seven chapters; and (4) the order Neziḳin, treating of the demons and "ḳelifot," and divided into six massektot and seventeen chapters. The second main division, entitled "Mafteaḥ ha-Neshamot," contains the order Nashim, treating of souls, in twelve massektot and forty-eight chapters. The third main division, entitled "Mafteaḥ ha-Kawwanot," contains the order Mo'ed, divided into fifty-eight massektot and 371 chapters, and treating of the Kawwanah. It will be seen that the number of massektot in this work is 112, corresponding to the numerical value of the sacred name ; and the number of chapters 547, equal to the numerical value of Ricchi's name, , plus twelve, the number of its letters. The sources for this work besides the Zohar are mostly Isaac Luria's and Ḥayyim Vital's writings, of which the "Sefer ha-Gilgulim," "Kanfe Yonah," and "Shulḥan 'Aruk" may be particularly mentioned. Ricchi drew also from other cabalists. The "'Olam Ḳaṭon" was separately edited by Eliezer b. Moses, with a commentary of his own, entitled "Derek ha-Melek" (Dyhernfurth, 1753). J. M. Zunz, in Ha-Nesher, vi. 71, 74, 78.